The Wollemi Pine is a beautiful and majestic pre-historic monster. This large tree is a relatively "primitive" plant, thought to have survived in its deep canyon wilderness for perhaps 200 million years. When David Noble abseiled into that narrow gorge in late 1994 and puzzled over the unfamiliar bark and leaves of the strange giant that confronted him, he made what has been described as the greatest botanical discovery of the 20th century. Chris and I were electrified by the announcement and resolved to translate our enthusiasm into a fine work of art to celebrate the Wollemi Pine's survival. The work's historical importance as the first detailed, fully comprehensive colour plate describing Wollemia nobilis is well supported by the elegance of the design, the professional accuracy of Chris's careful line-work, and the beauty of her watercolour rendering. 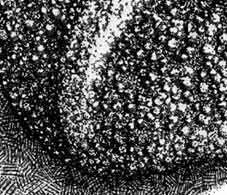 I believe it will come to be regarded as a landmark of Australian Botanical illustration. To date, five of Chris's Wollemi portraits hang in State and Territory collections. Her painting takes us on a journey through the Wollemi's past, present and future. The Talbragar Fossil was uncovered long before we knew of the living treasure hidden deep in the Wollemi National Park. It was as though this fragment of Jurassic silt had come back to life. No other living tree of its family "Araucariaceae" begins to bear such close resemblance, as does that ancient sprig of stone leaves. 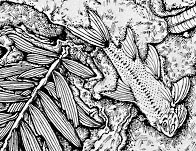 Chris has drawn the fossil in exquisite detail, even to the tiny fish that once swam in pools shaded by the Wollemi Pine's primordial kin. Chris's colleagues at the Royal Botanic Gardens in Sydney generously gave her access to actual Herbarium specimens as well as crisp transparencies and scanning electron microscope images. Their enthusiasm and faith in Chris's skills and sincerity have made her Wollemi portrait the lovely, lyrical document that it is. The richly coloured bubbled bark is alive with dormant shoots and the vastly enlarged 3-part pollen grain sits on the paper surface like a sandstone sculpture. Chris has fastidiously arranged the male cone beneath the female cone as they are often positioned on the tree itself - this orientation demands up-drafts to effect pollination and may explain its persistence in such a deep, moist chasm. The delicate seedling in the top right-hand corner of the painting is a sensitively observed record of the very first seedling grown "in captivity" by Cathy Offord at the Mount Annan Botanic Gardens. She welcomed us warmly into the nursery where Chris made sketches and colour studies and where she got a feel for the living plant. The broad leaves Chris has curled about the base of seedling No.1 are those of the Coachwood and Sassafras with which the Wollemi Pine competes for available space, light and nutrients. They are both far more recent, sophisticated and successful in evolutionary terms and may also have to shoulder some responsibility for the Wollemi's precarious perch on the edge of extinction. The most recent information we have on genetic research into the Wollemi pine is suggesting that DNA samples taken from several of the 39 remaining wild plants is showing no discernible variation. 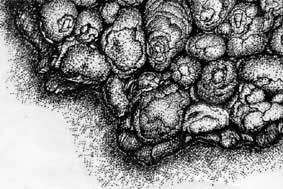 It may be found, in the near future, that our tiny remnant grove is, in fact, descended from a single individual organism. The Wollemi Pine may indeed be the rarest tree on earth. Many heartfelt thanks to Ken Hill, Jaime Plaza, Cathy Offord, Don Blaxell and Annette Wilson. Chris and I hope you like our portrait of the Wollemi Pine - we are both very proud of it.